Bouncing Buttons crafts making it simple: Underoos? We are busy with "potty camp" at our house. The big problem we had was my little girl LOVES having Elmo on her pampers. We used only cloth from birth until last Nov. or Dec. Our washer broke so hubby picked up Elmo pampers to use until we got the washer fixed. We decided to keep buying Elmo pampers because life was so busy and crazy around the holidays. We got a puppy for Christmas I had to put off potty training so I could spend a couple weeks on potty training the puppy then another 2 months on training her to not chew up everything in the house. Brobee (our pup) still chews but she chews on her toys more and on our shoes and kid toys a lot less than she did a couple months ago. I decided it was time to give potty training another try. Back before we bought the first pack of pampers she was already using the potty a few times a day. Life was a bit crazy back then so I didn't have the time to focus on potty training (I think we did the opposite and diaper trained her from Dec.-Feb.). When my child started yelling Mama I need a diaper change. I messed my pants a few weeks ago. I knew I needed to find the time to potty train her. 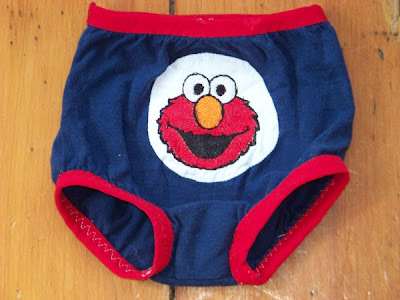 Zehira told me she didn't want to give up her Elmo diapers. She said she loves her Elmo. I decided to make her up some big girl Elmo pants to replace her diapers. The blue with the red trim reminds me of Underoos we had when I was a kid. When I first showed them to her she cried and said she didn't like them. She then told me she liked her "baby Elmo" (Elmo diapers). We told her she was a big girl and she has new Elmo big girl pants she cried again and told us she is a baby. We didn't make her wear them we told her she didn't have to wear them. We reassured her that we love her very much. I put them on the coffee table so she could pick them up and look at them whenever she wanted. We told her that she is not a baby. She said she is Daddy's baby. Rob stopped calling her a baby and started calling her his big girl. The next day she walked over to the table and picked up the Elmo undies. She tried putting her legs in them on her own and yelled need help mama. I ran over to help her. I hugged her and told her how proud I was that she wanted to wear the big girl undies. I told her to try not to pee pee on Elmo because that might make him sad. Back in Oct. and Nov. she was using the potty a lot so I knew she understood. She was very happy with her new big girl Elmo and is doing wonderful with going on the potty. Today she told us she needed to go potty when she needed to go #2. Potty camp is going wonderful.... I might have a different story to tell tomorrow. But today I am enjoying the progress we are making. Once she put on her big girl Elmo undies I got busy making her a bunch more undies. She already had several big girl undies (store bought ones) but I thought we would need a large stack so we didn't run out if we had a day with a lot of mistakes. 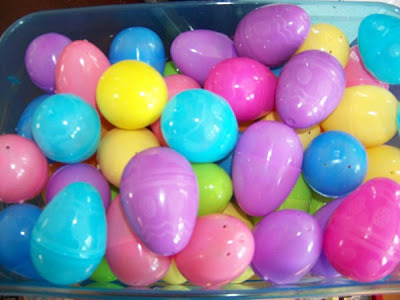 Easter Eggs with 2 jellybeans inside each one. This bucket I did fill with eggs, DVD's, Polly pockets, Kai-lan figures and other toy treasures. I told her she could pick one thing every time she uses the potty. I have to say I was so surprised she didn't pick out any of the toys in the bucket. She says needs candy inside egg every time she uses the potty. I took out the toys just have eggs in the box because Zee told me to take the toys out of her candy box. If 2 jellybeans is what she wants why try to force her to take toys? Demi wanted the toys so she was trying to make Zee pick a toy. I think this might be why Zee likes the candy so much... She doesn't have to share the candy with her sister. I would love to say we are all done with the potty camp but I am sure we will have a big step back sometime in the next few weeks (I can remember having a oops day with Demi after she stopped wetting in her pants). I hope to be ready to calmly deal with it when that day comes. Today I am going to sit and enjoy how far we have moved ahead. It is kind of sad having to think you no longer have a "baby" in diapers living in the house... I will turn 40 at the end of this year I think I am getting ready to move on to a new phase in my life... I hope it is something as enjoyable as having babies was!